In the expansive land of China, there is a plethora of different cities, provinces, and regions, and each have their own unique cuisines. These cooking styles are broken up into the 八大菜系 or The Eight Cuisines of China. Each of these styles of cooking demonstrate the history, landscape, and ingredients of the diverse regions of China. With a total of six Chinatowns, my home, New York City, is home to the largest Chinese population outside of Asia. These immigrants flock to New York with their cultures and cuisines ready to share. This makes New York the perfect place to do a food tour to discover The Eight Cuisines of China. Cantonese Cuisine, also known as Yue Cuisine, is one of the eight traditional cuisines of China. It is the culinary style of the Guangdong Province which is located on the coast of the South China Sea. With a mild subtropical climate, an abundance of arable land, and a rich network of fresh and sea water, the ingredients for Cantonese Cuisine is abundant and diverse. Cantonese people can enjoy rice, fruits, vegetables, and seafood year-round. Guangdong dishes are characterized by their use fresh ingredients and the frequent addition of slightly sweet tastes. Many Cantonese dishes take lots of technique and skill to prepare, which is showcased in many dim sum dishes. In contrast to other traditional Chinese dishes, Cantonese people prefer to braise, stew and sauté their food which aim to minimally treat food and preserve the flavor of the dishes. Congee Village is an always packed Cantonese food institution on the border of Chinatown and the Lower East Side. Its in-between location of authentic Chinatown and gritty, hipster East Village are represented in the restaurant's classic Chinese dishes and western metropolitan vibe. The restaurant is a Chinese college student hub where homesick students can get a taste of home with their friends. Congee Village has very interesting decor with their outlandish dinning rooms chock full of bamboo and plants to evoke the feeling of being in a Southeast Asian village. The bright lights and the loud Chinese patrons give the restaurant an electrifying feeling. Congee Village serves some of the best Cantonese food in New York. The namesake of the restaurant is showcased in their menu with twenty nine different varieties from crab to the classic sliced pork and preserved egg. The warm and comforting rice porridge is prepared expertly at Congee Village. The rice is supremely fine, the porridge is thick, and the ingredients of each version give the congee an intense umami flavor. Another favorite is their House Specialty Chicken that has a crisp paper thin skin, yet is still extremely moist from the savory sauce. One of the favorite authentic Cantonese dishes on the menu is the braised fried fish head with pork casserole. Braised dishes are a classic technique essential to Yue Cuisine and the Cantonese use every part of the seafood that they have accessible to them year round. The casserole has fried pieces of fish heads, tofu, and pieces of pork all braised together in a heavy clay bowl. Though seemingly a strange part of the fish, the heads are not really that offbeat. They have very tender meat with high collagen content, making the meat gelatinous and tasty. All of the ingredients come together to create a warming, delicious dish. A great vegetable dish is the sautéed mixed vegetable that showcases the seasonal, traditionally Cantonese vegetables stir fried with scallops. The peas, bok choy, and baby corn are just lightly cooked so they can retain their fresh crispness. My favorite dish at Congee City is the House Specialty Shrimp Pasted Pork Ribs. The are exactly what the name says; pork ribs coated with shrimp paste and fried. They are crispy and meaty with the shrimp pasted giving the ribs a sweet, seafoody flavor. All the food at Congee Village is delicious and authentically Cantonese and the restaurant's character is just as authentic. Bensonhurst, Brooklyn's Bamboo Pavilion serves dishes that taste straight out of Sichuan. Found in a neighborhood filled with Italian bakeries and gelaterias, Bamboo Pavilion is no long alone. Poised to be the newest of New York's many Chinatowns, Bensonhurst is see a wave of Chinese that are opening Chinese bakeries, bubble tea shops, and of course restaurants. Bamboo Pavilion is small, but very neat and adorned with wood accents throughout. They also have a back garden that is a perfect place to sit during the spring to enjoy your meal. The restaurant does not bother with tacky decorations because what really shines at Bamboo Pavilion is not the store, but the food. All of the dishes are authentic Sichuan and are perfectly prepared with time and care. The small spread that is offered after you order while you are waiting for you food hold one of the restaurants hidden gems; picked bean sprouts. The sprouts are chilled, savory, and laced heavily with garlic and are a perfect way to get you ready for the delectable meal to come. The tea smoked duck always gets to the table first with its dark skin glistening and gleaming and deep smoky flavor wafting through the air. Underneath that paper thin skin hides a thick layer of melting duck fat that tops the ruby red duck meat. The delicate duck is always beautifully prepared and is profoundly smokey. The first spicy dish was the braised fish fillets in chili sauce. The tender pieces of fish are floating in a bright red bath fortified with handfuls of Sichuan chilies. The hot and spicy sauce give great flavor to the soft, almost fragile fish. You will need a stack of tissues and to get ready to sweat, but it sure is worth it. The most famous Sichuan dish, Mapo Tofu, will not give you a break from the spicy foods. The soft, pure white tofu is cooked gently in a thick chili sauce not unlike the broth for the fish. The clean tofu balances out the intensely aromatic sauce and all together makes a uniquely delicious dish. To take a break from all that spice a great vegetable dish is in order; a plate of sweet potato greens. Sweet potato greens are actually a favorite in Sichuan where they are used abundantly in dishes. Their subtle sweetness and softness are what make them so attractive. Another of my favorite Sichuan dishes is the Sichuan chicken. The chunks of bone in chicken are fried to make the skin crisp and the chicken dry and then it is coated with a chili oil and tossed with aromatics. The chicken is so amazingly good. It's everything you would ever want; crispy, salty, spicy, garlicy, and just delicious. The beef tendon salad is another an authentic dish of cold, thinly sliced pieces of tendon and meat in chili oil. The tendon is chewy and the meat is soft and together they are a refreshing, tasty snack. Bamboo Pavilion really is the best Sichuan food you can find. It is not the spiciest Sichuan food, but it definitely is the most balanced, tasty, and well made. Shandong, on the northern coastal province of China, is blessed with an extensive coast that provides fresh fish and seafood. The close proximity to the coast makes seafood an essential part of the cuisine. Wheat noodles and wheat buns are also fundamental foods in Shandong because the region produces lots of wheat and corn. The chefs of Shandong pride themselves on preparing their many different seafood and vegetable dishes in their style of frying that locks in flavor, yet isn't oily. This method of searing vegetables and meat over an intensely high heat, which is referred to as 爆 (bao), singes the outside of the food and protects the flavor of the inside, all while protecting the food from absorbing any of the oil. Shandong cuisine, though less popular in America, is one of the most influential in China. It's influence rippled through the regions around it. Many cities in the north of China including the capital, Beijing, prepare food using simplified Shandong methods. In an offbeat part of Flushing, a booming Chinatown in Queens, there is a jewel that offers patrons an immensely flavorful taste of Shandong cuisine; Golden Palace. The decor of Golden Palace is pretty nondescript and standard Chinese restaurant with red table cloth, glass lazy susans, and Chinese ornaments plastered along the walls. One distinguishing factor is the constant stream of Chinese expats eating and there not here for the furnishings, but for the food. The food in Shandong is essentially rice free because it is not near the landscape of China that can grow rice, but they do have wheat. This region's agricultural idiosyncrasy led to a cuisine that is depended on wheat and other starches to make noodles and breads..... And bread is the perfect way to start off the meal. Golden Palace offers a variety of Shandong bread pastries filled with meat, scallions, or peanut paste. They are flaky, crumply pastries filled with these delicious flavorful fillings. Along with these breads come the cold dishes. The most interesting of which is the pig's trotter aspic with tendon which is a terrine of which a pig's foot is boiled, deboned, tightly rolled, cooled, and then finally sliced. Looking at the slices is like looking at a cross section of the anatomy of a pig's foot. The aspic, marinated in chili oil, is deliciously spicy and is an ensemble of interesting textures from each part of the foot. The sheets of opaque tendon is made by heating strips of pig tendons and cooling them down in a mold. The tendon is chewy and gelatinously delicious. My all time favorite dish is the cold liang pi noodles, which is a cold dish of flat wheat noodles mixed with crisp julienned cumbers, refreshing bean sprouts, and a vinegary sauce with hint of heat that just slowly burns in the back of your throat. This sour, cool dish is so refreshing and a delectable break from the heavy foods that is common place in Shandong cuisine. Another, much heavier, noodle dish is Golden Palace's noodle with braised pork. It is made of clear, slippery sweet potato noodles and chunks of pork belly that have been braised in soy sauce giving the meat a red hue. The soft noodles absorb all the sauce and drippings from the meat giving the noodles a savory, meaty flavor. The food at Golden Palace is balanced and is executed with the utmost skill. Shandong food is hard to come by in New York, but Golden Palace definitely fills that culinary void. Fujian Cuisine or Min Cuisine originated in the southeastern province of Fujian, which is on the coast of the Pacific Ocean. This means that, similarly to Shandong cuisine, fish and clear broths are the backbone of the cuisine. Fujian cuisine is broken down into three regional styles: Fuzhou style that is light fare compared to other styles and often includes sweet and sour elements; southern Fujian style has spicer flavors from mustard and pepper; and western Fujian style has stronger flavors than Fuzhou because of the more common use of spices and has Southeast Asian and Japanese influences. Peanuts are a prevalent ingredient in Fujian cuisine, both in savory dishes and desserts. Fujianese are also well known for their "drunken" (wine marinated) dishes and for their stocks and bases that are used to flavor their dishes, soups, and stews. A hectic, crowded store that promises the best example of fujian cuisine in New York. There are some really good Chinese restaurants in the city of New York, but I have to say that the Lucky Zhang's Family at 8th Avenue, Brooklyn is my favorite place to sample Fujian cuisine. The restaurant is located on the busy 8th Avenue near Sunset Park, Brooklyn, home to many immigrants from the Fujian Province of China. This area is slowly becoming the second largest Chinatown in New York City. When looking for authentic Fujian cuisine, there may be no better place than Lucky Zhang's Family. The restaurant is always crowded with Fijians expats, so you know it's the real deal for an authentic and very affordable bite. The restaurant kind of dingy and disorganized, but it is an authentic, real restaurant where you can experience both the people and the food. Walking through the neighborhood gave you a strange exploratory and nostalgic feeling of what you might imagine trekking through China would be like. Having eaten here on a few occasions now, the food is uniformly superb. Oyster pancakes (海蛎煎饼) are a common breakfast food for most Fuzhou natives and they are really well made at Lucky Zhang's Family. The oyster omelet is a strange pairing of eggs and oysters that actually works. The delicate seafood and the rich eggs together with minced pork, green onion inside, plus whatever seasoning the chef fancies make a delicious dish. Ban Mian noodles (拌面 ), which is directly translated to mixed noodles, are a must-try when you're here. It's a brilliantly simple dish, but what makes it unique is the sauce, which is mainly made of peanut butter—an unusual ingredient in China. Another classic dish to order is their Lychee Pork. This is one of most Fuzhou's renowned dishes, and the restaurant prepares the local favorite well. The name of Lychee Pork is attributed to the fact that the deep fried pork is cut into small pieces that resemble Lychee once cooked and doused in the signature red sauce. The sauce is made from ketchup, vinegar and sugar, which gives the dish a balanced and very complex sweet, salty, sour, and sweet flavor. The perfect food for a cold, rainy day is soup; and there is nothing better than bian rou which is a salty broth with small floating wanton skins that wrap a tiny dollop of meat. Lucky Zhang's Family is a really good store to get a taste of a far away place. There are always quintessential Fujianese snacks and dishes being offered. Jiangsu Cuisine, which originated from the east coast of China, is one of the more refined, polished cuisines of China. Su Cuisine is composed of six styles: Huaiyang, Nanjing, Yangzhou, Suzhou, Xuzhou, and Haizhou, all of which value the artistry of cooking. Jiangsu chefs pay careful attention to the aesthetics of the food, like the colors, textures, and shapes of a dish. The food of Jiangsu is characterized as being soft, but never mushy. As it is close to the sea, seafood is a very common ingredient, as are the vast array of agricultural products. The food in Jiangsu is dictated by the season and weather to create balance in their diet. A very famous way of cooking in Jiangsu is called 红烧 (hongshao), which literally means "red braised" because the addition of sugar and soy sauce result in a fragrant, savory, red colored dish. Nan Xiang Dumpling House in a popular part of Flushing, Queens that is home to many restaurants that showcase food from all around China, but many walkers decide to stop here. Why? The xiao long bao of course. Xiao long bao or soup dumplings are exactly what they sound like; dumplings that are filled with soup. At Nan Xing when you order your xiao long bao you can look behind the glass wall where you can watch the skilled chefs make your steamer basket. The soup dumplings at Nan Xing Dumpling House have a thin, delicate skin that balances perfectly on the precarious border of being too think that the flavor of the filling is overshadowed and too thin that the whole thing falls apart. The filling of the dumplings is a delicious mixture of juicy pork and plenty of the delicious broth with the option sweet crab meat. The soup dumplings are steamed to perfection in the bamboo steamer baskets. Eating xiao long bao is really a difficult skill that if done incorrectly can lead to embarrassing spillage and painful burns, but once you get the hang of it you will experience the true deliciousness of xiao long bao. 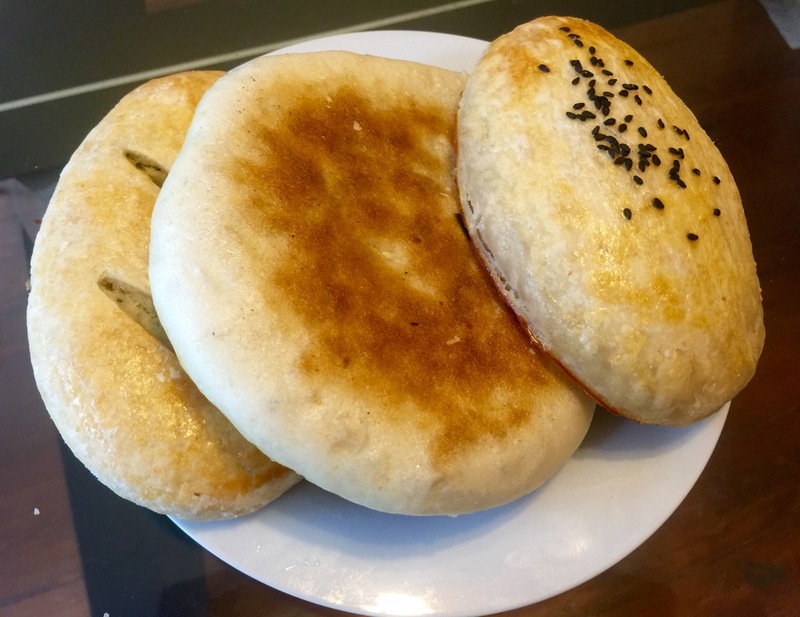 Soup dumplings are not the only delicious Jiangsu dish that is served at Nan Xing Dumpling house, another delicious snack is the fried rice cakes. They are golden brown rice cakes with a slightly salty flavor that makes it irresistible to take another bite. This classic street food has a crispy crunchy outer layer and a heavy, sticky rice center. Another very interesting dish are the turnip puffs that are thin slices of soft turnips surrounded by a sheets of pastry. The pastry layer is immensely crunchy and the soft, savory vegetable filling are really good complements. Nan Xing also has drunken chicken, which is a cold dish of chicken that is braised slowly in a sauce of Chinese cooking wine. The result is flavorful chicken with crisp skin and tender meat. Another traditional Jiangsu dish is the their shaomai or shumai, which is very different than the Cantonese version. The Jiangsu shaomai is made of a drier skin that wraps a slightly sweet, dark sticky rice mixture instead of pork and seafood. The final dish we had was a special of extremely fresh fish belly braised in a dark, thick sauce. The freshness of the fish is what really made the dish. The flavor had a slight seafoody sweetness that is characteristic in fresh fish and had a soft, supple texture. The fish in the savory sauce made the whole dish came together in a tasty way. Zhejiang cuisine, also known as Zhe Cai for short, is cuisine from Zhejiang Province which is located in South East China. Taking advantage of the location on the fertile lower Yangtze River, Zhejiang is referred to as the “land of fish and rice”, and Zhe Cai’s ingredients are very diverse. Zhejiang cuisine is famous for its unique, fresh, and mild tastes, its emphasis on the natural flavor of its key ingredients, and its elegant appearances. Zhejiang cuisine is best represented by Longjing Shrimp (龙井虾仁), West Lake Vinegar Fish (西湖醋鱼), Dongpo Pork (东坡肉), and Songsao Shredded Fishsoup(宋嫂鱼羹). Maple Garden from the outside is a nondescript doorway in the center of Flushing. The door looks like it can lead to anywhere, but once you walk through the door, you realize you have entered a hidden archive of delicious Zhejiang cuisine. Zhejiang cuisine is not a very popular cuisine in New York, due to the lack of immigrants from that region of China, but at Maple Garden (a primarily Shanghainese restaurant) has some classic Zhejiang dishes on its menu. A famous Zhejiang dish is the seafood tofu soup. The soup is thickened with corn starch and has strips of thinly sliced tofu and black wood ear mushrooms. The soup warms the soul with the warmth and umami flavor. Another dish is the Longjing Xia Ren (龙井虾仁), or literally Dragon Well Tea Shrimp, one of the most well-known Zhejiang dish. Longjing (Dragon Well) is a famous variety of green tea from Hangzhou in the Zhejiang province in China. Renowned for its high quality and intensely fragrant body, Longjing tea is well regarded as one of the most famous teas produced in China. The superb flavor that it imparts on this simple dish of shrimp is astounding. The glistening shrimp is to be dipped in vinegar and enjoyed just as. 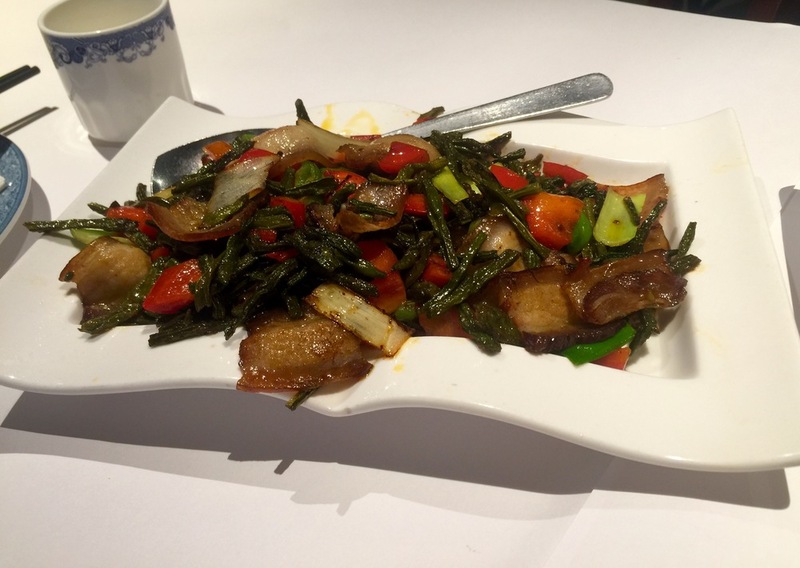 At Maple Garden you can get a rare taste of traditional Zhejiang cuisine that is very hard to find in New York. Hunan Cuisine, also called Xiang Cuisine after the area's river of the same name, is a cuisine from Hunan Province. Hunan is located in central China, surrounded by lakes, rivers and mountains, with a humid and subtropical climate ideal for agriculture. The people of Hunan have traditionally preferred food that is spicy, sour and salty. Xiang Cuisine is actually hotter than Sichuan Cuisine. People from Hunan use a lot of peppers, scallions, and garlic in their food. Hunan Cuisine is especially known for its stewed dishes as well as its soups. A favorite Hunan Cuisine dish during the winter season is Hot Pot. Hunan Manor is a charming Chinese restaurant five minutes from Grand Central. This midtown Chinese restaurant offers an array of classic Hunan dishes along with some americanized Chinese dishes for the office lunchers. Hunan Manor is decorated with a distinctly Chinese theme. The red walls, lantern fixtures and traditional Chinese paintings that adorn the wall remind you that you are going to experience some tasty Hunan food. I visited Hunan Manor during the lunch rush one Saturday afternoon. The restaurant was filled with a jumble of Chinese patrons and businessmen and women who were their for lunch. The dishes we ordered are really delicious and intricate with every item served hot and fresh. The first dish we ordered was the preserved pork with dried string beans. The tender slices of tea-smoked pork belly stir fried with salty Hunan-style dried string beans was a flavorful combination. The smokey rendered fat from the wok fried pork coated the dried string beans giving the dried beans a leathery texture and concentrated meaty flavor. Then we took on a much hotter dish: Dong Ting sautéed frog. This is a dish of a not so common protein, frog, cut up into small chunks and stir fried with tons of chiles. Unlike Sichuan dish where Sichuan peppercorns are combined with chilies for a"numbing-hot" flavor, Hunan styled dishes uses fresh chilies and sauces for a sour,spicy, and salty effect. The frog has lots of little bones, making it tricky to eat, but overall the flavor of the dish and the texture of the frog is unbeatable. A great vegetable dish is the Spicy Cauliflower with Dried Pork because the fresh cauliflower is a perfect pair with the briny salted meat. All the ingredients cook together in a metal wok at the table. The cauliflower has a very clean flavor and is flavored by the thin slices of the dried pork giving it a prominent savory taste. The last dish is a very famous Hunan dish, Braised Pig Trotters. The pigs feet are braised low and slow for hours until the meat is deep red and falling off the bone. The delicious, glistening meat is served with beautiful, white mushrooms and, of course, peppers. As it is done in Hunan, the restaurant serves the dish in a decorative bamboo box. The tender, gelatinous meat is a really tasty and interesting snack that, like everything at Hunan Manor, has tons of flavor. Anhui Cuisine is derived from North China’s Anhui Province. Anhui Province is abundant in mountain delicacies, wild animals, and river-food which provide Anhui Cuisine rich local ingredients. The use of local materials makes the freshness of the dishes unparalleled. Hui Cai places a great deal of emphasis on natural foods which makes it a healthier cuisine. Some dishes representative of the Hui style of cuisine are: Stewed soft shell turtle with ham (火腿炖甲鱼), LiHongzhang Hotchpotch (李鸿章杂烩), and Bagong Mountain Bean Curd (八公山豆腐). Anhui Province is a poorer inland province west of Shanghai, and Anhui Cuisine is one of the lesser known of the Eight Great Cuisines of China. There are very limited choices for Anhui restaurants in the New York City area. Different from other cuisines, Anhui Cuisine attaches importance to its ingredients and their wild herbs that really make their dishes fragrant. Anhui food is described as being characteristically hearty and know for their use of a variety of very interesting ingredients from the mountains. Its a real shame that the are no restaurants that specialize in Anhui cuisine in New York. This may be due to the lack of Anhui people in New York, but without any restaurants that can represent one of the eight most important cuisines in China. This void will hopefully be filled soon, but in the mean time, you can try some Anhui dishes in restaurants that specializes in other cuisines. Some quintessential Anhui dishes include bamboo shoots cooked with sausage and dried mushroom and Royal Pot (Yi Pin Guo). The dish of bamboo shoots include some of the traditional flavor of the Huizhou mountainous area. Cooked with sausage and dried mushrooms, the tender bamboo shoots have an amazing fragrance that just gets you excited to eat. It is delicious because of the thick, savory sauce that coats the bamboo shoots. Another of the Anhui dishes is called Royal Pot (Yi Pin Guo). Yi Pin Guo is a very intricate Hui-style hot pot made with dried bamboo shoots are layered on the bottom of the pot, then chunks of meat are put on the second layer, fried bean curd on the third, pork meatballs on the fourth, and bean sprouts covered by spinach or dried lily flower. Then all of this is seasoned with fresh herbs and then simmered in a pot. This dish is famous for its local flavors and has a distinct herbaceous quality. Anhui cuisine is comprised of so many really delicious dishes that New York, for the time being, is deprived of.